So I tried to inspire you all with my creative labeling … and surprisingly … what was most interesting to many was the labels in my fridge. I will say, labeling the inside of my refrigerator has been life changing. No kidding. When you use something every single day, multiple times a day, it’s a big thing to make it simple to use. And labels, quite simply, make life simpler. OK … back to the real world. Here’s my labeled fridge. A few things to notice … before we see more pictures. 1) it’s not perfect! To me, the point of getting organized is something much greater than perfection. It’s to make life a little bit more fun, and a little bit easier … so we have time to do things that make us happy. 2) If you zoom in really close, you’ll see lunch-ables. I, by no means, advocate the eating of lunch-ables. In a weak moment at the grocery store, I caved in to my 7 year-old son’s pleadings and treated him to just one! 3) lots of eggs … we’re dong a south beach diet of sorts … so the eggs are in three places: where they belong, in the meat drawer, and on the overflow shelf. OK … so there you have it, my refrigerator. Who knew I’d be posting pictures of my fridge on a blog??? Renee made me do it. Love the pics of your fridge…I am so inspired to get that labeler out and put it to good use! This so much fun and inspiring… It looks very good!!! Wow, this is incredible. 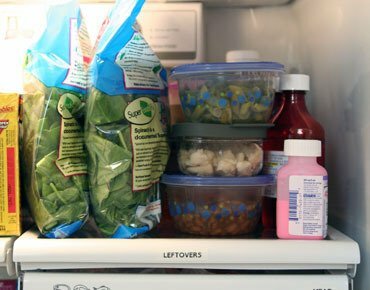 I honestly do not know if I can be this organized in my refrigerator, but I may give it try. Usually I’m shoving things around, just to find room to fit things in. that lazy susan idea ROCKS! i hate diggin’ for “stuff”! Okay…just got to say that’s a lot of eggs! I saw this and went out right away to buy a label maker! Right now Office Depot has the P-touch 65 on sale for only $9.99, reg 29.99!! Fabulous post … I’m getting so much inspiration from your blog about how I can organise myself better. I’m getting a new fridge myself very soon and I am definitely going to go with labelling now! THANK YOU! What is it with all of the eggs? I found your blog linked in my friend’s blog list, and sooo glad I found your blog! I am in need of organizing tips and inspiration! I love how organized your fridge looks, and the labels probably help it stay that way, too! No more guessing when putting away groceries. Even the kids can help maintain it better! I love the lazy suzan thing and the basket idea for picnic condiments. Wow! Waaay kewl ideas! Thanks for sharing!!! 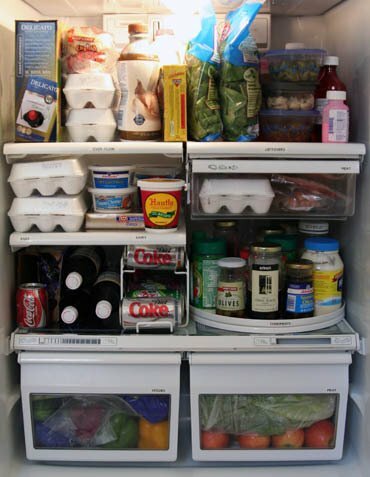 i am a neat freak, but i dont know about the frig….it is usually half empty cause i dont cook! love to see your organizing ideas! I love that you have a lazy susan in the fridge — what a great idea!! Ok, the best thing about these photos is that I have proof positive that I’m not the only one who took the label maker and labeled the fridge. Yay! I’m not alone! I just showed this to DH and he thinks it’s a GREAT idea! I guess I’ll be cleaning the refrigerator tomorrow! I DO have a lazy susan, and I LOVE it! The leftovers section is what sold me on this. Thanks! I just spent the past 2 days organizing the pantry. The fridge is definitly next. Thanks for the inspiration. I love my labelmaker, but I’ve never thought of labelling the inside of my fridge! What a brilliant idea, I’ll have to blog your post, this is too good not to share. 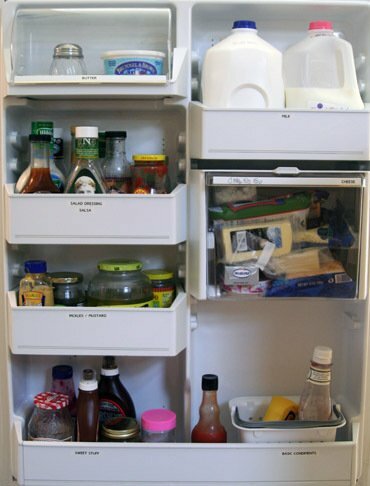 I am either hot or cold on organizing (haha) – anyway, I do have my refrigerator labeled & I think it helps A LOT! And buddy, you better put stuff on the right shelf!!! I just finished labeling my refrigerator after following your example, turntable and ALL and I keep opening the doors because it looks amazing and we can find anything and everything. THANK you TONS for this post, it has not only changed one of the most important places in my kitchen, but also our lives. Seems exaggerated, but true. My three year old son recognizes his name on the label I put on one of the door containers with snacks and drinks only for him.